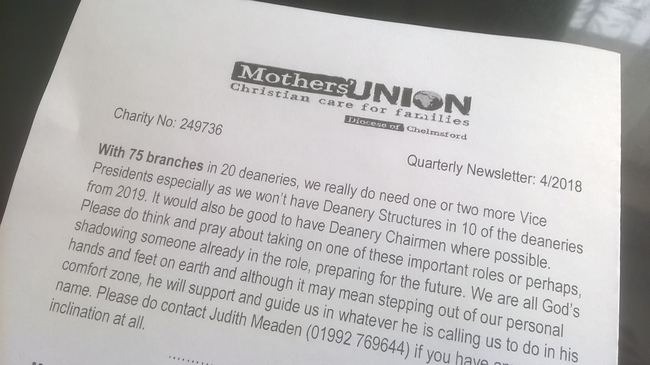 This quarters newsletter is asking for help with finding a couple of Vice Presidents… It would also be good to have Deanery Chairmen where possible. Please do think and pray about taking on one of these important roles or perhaps, shadowing someone already in the role, preparing for the future. We are all God’s hands and feet on earth and although it may mean stepping out of our personal comfort zone, he will support and guide us in whatever he is calling us to do in his name. Please do contact Judith Meaden (01992 769644) if you have any inclination at all. Margaret Harvey, our Diocesan Secretary, has indicated her wish to stand down from this role in the summer of 2019; a role which she has filled for many years. This role is imperative for the diocese to run as it should so please do pray that someone will come forward. If you feel at all interested, please do speak to Margaret or Judith Meaden to find out more about the role which is self-employed, part time, working from home with a dedicated MU broadband line. Admin skills and a good knowledge of MU are a must. Please check out the coming events and put them in your diary and if you have an event in January, February, or March 19 please email the details to: joan@grabawish.com for the next issue.